Ann Gérard Cuir de Nacre is one of my favorite types of fragrances — a leather chypre — by one of the perfumers whose work intrigues me most, Bertrand Duchaufour. When I opened my decant, I wanted to be swept away by Cuir de Nacre’s beauty. But then again, it wouldn’t be so terrible if it smelled enough like other leather perfumes to spare my wallet. It must smell divine. Cuir de Nacre’s notes include angelica root, ambrette, aldehydic ozonic notes, cassie, iris concrete, leather accord, sandalwood, white musk and styrax. 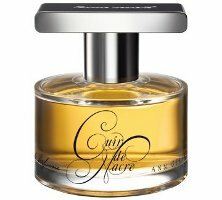 Cuir de Nacre’s soft leather and iris ride in on a cloud of aldehydes with a tickle of peppery angelica root. As the fragrance settles, the cassie (also known as mimosa) adds its strange and slightly fetid buzz to the mix. And is Cuir de Nacre ever mossy. Moss lovers will definitely want to sniff how moss cushions the fragrance, puffing and peeking out like a crinoline a touch longer than its suede skirt. Now let’s deal with Cuir de Nacre’s white musk. It’s definitely there, soaping up the perfume’s heart, but not aggressively. At first, I wasn’t sure how I felt about the musk. After all, for me it was the white musk that sank Guerlain L’Heure de Nuit. Why did Duchaufour have to take such a velvety skin leather and give it a whiff of shower stall? Then I grew to appreciate how the musk adds a casual touch of modernity. The musk surprises, subtly, and is restrained enough that Cuir de Nacre’s moss, sandalwood, and leather more than stand up to it. This fragrance is cannily blended. Cuir de Nacre would be as natural on a man’s skin as a woman’s. It should fit into my life. I love lots of fragrances that simply don’t jive with my life. I know lots of you revel in wearing big, glamorous fragrances in your jeans, but it knocks me out of sync. Cuir de Nacre is elegant but not snooty. You don’t have to wear pearls to pull it off, but it smells like you might have a Duchess somewhere way back in your family tree. Also, Cuir de Nacre isn’t a statement perfume. Most people probably won’t notice it, but will unconsciously register an interesting, broken-in warmth when you're around. It should differ from other fragrances I own. Of my softer leather fragrances, DelRae Mythique is saltier and more youthful; Chanel Cuir de Russie is sharper and more animalic; Lancôme Cuir de Lancôme is wetter and more floral; and Serge Lutens Daim Blond is, well, more Serge with its cedar and apricot. It should have appropriate sillage and wear time for the type of fragrance it is. Cuir de Nacre is quiet. It melds with my skin, making me smell less like perfume and more like I’ve been sleeping in a leather trunk on a bed of peppery iris and moss. If I spray it on at breakfast, it’s gone by mid-afternoon, despite being Extrait de Parfum. I wouldn't mind a little more persistence. It should be worth its cost. Cuir de Nacre costs $165 for a 60 ml bottle of Extrait de Parfum. Not cheap, but not ridiculous — many of the 100 ml L’Artisan Parfumeur Eaux de Parfum cost the same. Given how interesting Cuir de Nacre smells, and how often I can imagine wearing it, its price is plenty fair. Verdict? When my decant runs dry, a bottle will be mine. Mmm. Another light leather beauty. Thanks for the temptation, Angela. I’ve been eyeing the Ann Gerard coffret on Lucky Scent. All the fragrances look lovely. At least one from the two of us likes it Angela. I wanted to try Cuir de Nacre for a while. When finally I got a sample in a swap and it arrived I gave it a sniff and just then I knew I was quite disappointed. I spent few days wearing it. Too short lived and quiet. I may be a rookie in terms of leather perfume, it’s been just a short time since I like leather chord in some perfumes. Cuir de Nacree is a pass for me. Cuir Ottoman will be my one and only leather at the moment. Not everyone loves leather, that’s for sure! When I tried first leather perfume I really liked I went on a smelly research to find the best leather for me and that’s Cuir Ottoman. Then I’m glad you found it. It’s a good one. Ah, Lucasai, so glad to hear this as I am also a bit ambivalent about leather. Glad to hear it can just be a question of finding one that fits; that makes me want to have another run at them! The searching and sampling is always fun! That coffret is great. I love all three scents, but Cuir de Nacre and Ciel d’Opale are my favorites. I haven’t tried the other Ann Gerard scents, but I’d sure like to. Haven’t tried any of these Ann Gerard, but boy have they been getting some loooove lately! I don’t think I need another leather fragrance – I love my Cuir de Lancome, and what I can always use is another green floral, or another aldehydic floral, or another (duh) floral-floral. But I’m so glad you like this one. Saw the title of the post and knew it was one of yours before I read the byline! This one went on my must-have list, too. Leather is a category I’ve come to appreciate only fairly recently, so this is different from most everything else I own. I sort of like that it’s not a huge, statement fragrance, but it does last (quietly) six or eight hours for me. Six to eight hours is a respectable life! Enjoy that bottle, once you have it. how does it compare to Bottega Veneta? For one thing, Bottega Veneta is more assertive. It has greater sillage and lasts longer (with a definite shot of patchouli in the drydown). I don’t get the same iris, mimosa, musk, and moss either. As far as both fragrances’ character goes, I’d say Bottega Veneta is the girl whose voice carries, but she sounds happy and interesting enough that you don’t mind when she prattles on about the flower market that morning or her vacation at Lake Como. Cuir de Nacre is more of an introvert, but when you’re invited to her house, you’re surprised at the fine, velvet-upholstered furniture and stocked bookshelves. Ah, I love this comparison. Def makes me more hopeful about Cuir de Nacre, as BV is too much for me. BV has a lot of personality, that’s for sure. Cuir de Nacre is much more understated–but still complex and interesting, in my opinion. Thank you, I will give it try! I don’t know this scent in particular, but you have managed to move it into my to-try list. Trying never hurts–then you can apply your own checklist! Oh dear, you are putting me off Bottega Veneta, which I had planned to give a serious try once the cool weather arrives here. Is she such a prattler? Lake Como indeed! I like your criteria very much and I am mulling over how they might be weighted differently according to circumstances. For instance, if something smelled less than divine but is extremely wearable and good value for money, would I buy it? I may do. Is ‘divine’ the most important criterion first up? Define ‘divine’! I’ve come to see Bottega Veneta as more and more of a prattler–she has a lot to say–but it turns out sometimes I like the background noise. Oh boy, “divine” really is a tough one, and truth be told very few fragrances are a “10” on the divine scale. And certainly it’s the total score that matters. For instance, I have a bottle of L’Eau de Chloé because it cost $7.95 at a thrift shop. I like it just fine, and I can imagine wearing it quite a bit during the summer, but it doesn’t make my heart beat fast enough to pay full price for it. On the other hand, I really am trying to pare out buys like that. Why pay anything for a fragrance I don’t truly love love love? Hmmm … I paid $12.95 for my Flower by Kenzo at a thrift shop and expect to wear it quite a bit in cooler weather, but no way would I have paid full price. Why buy it? I guess in my case because sometimes these are the fragrances that get the most use while the masterpieces sit unloved on the shelf. So funny that this exchange has come up, because I just got home from running errands and stopped by one of my favorite thrift stores on the way home and picked up a bottle of Agent Provocateur for $10. I nearly left it there, but the bottle is so adorable. I figure I can spray my mattress with it between bed linen changes, if nothing else. I don’t think I could have left that behind either! I came *this* close to buying a decant when the Google group offered a split of this, but the white musk tipped the scale for me. I actively loathe the stuff! I love your criteria! Thanks for reviewing (and you haven’t changed my mind, which you are very good at doing ). Yes, that ole’ white musk is definitely there. It’s not in-your-face, but it’s there. Money saved! “…and more like I’ve been sleeping in a leather trunk on a bed of peppery iris and moss.” Oh my goodness! That description is making me crave this. Thank you for this review! That description was meant to give you an idea of its gentleness–it’s a quiet skin scent to me. A nice one, though! As always, your writing is wonderful, Angela! I hope you’re writing a novel and will let us know when it is available? This article has made me want to sample the fragrance. I absolutely adored My Sin, which I wore back in the late 50’s/early 60’s, and that’s supposed to be a leather fragrance. I also tried Chanel’s Cuir de Russie a year or so ago and liked it so much, I decided I will have to try it again and maybe buy. Some reviewers think it resembles My Sin, but I can’t recall thinking that myself. How does Cuir de Nacre compare with either of these? I am writing a novel! In fact, I’ve written two of them, and they’re with my agent right now. I’m crossing my fingers. Thank you for asking. Gee, now I’m wondering if I imagined the leather note in My Sin, but some other people have mentioned it. I also wore Jolie Madame, which was very different, but also had leather. So I guess I like leather! (A revelation). I decided to google Long Lost Perfumes to see what they charged for their version of My Sin and can’t find their website any more. The fragrances are available through Amazon and discounters, but where is the site? Leather is definitely different when it takes center stage in a fragrance rather than a supporting role. In Jolie Madame, you can definitely smell leather as a main player, while it’s just a part of a larger fabric in My Sin. I hadn’t heard of Long Lost Fragrances disappearing! My heart was in my mouth somewhat as I read your review, Angela, as I remember adding my two penny worth to encourage you to buy the decant! I love how you teased out the conclusion to your question and finally I heaved a sigh of relief – you liked it – alot! White musk isn’t a deal breaker for me but I agree it is present enough for those averse to it to probably dislike this scent. The iris is just gorgeous and I never fail to be intrigued by the artful combination of those ozonic aldehydes and the cassie. It makes me want to try FM Fleur de Cassie again. It is a very sensual effect. I thought of Une Fleur de Cassie, too, when I tried it (although the cassie is much more subtle here!) What I liked so much about Cuir de Nacre is what I liked in Chypre Palatin: an unexpected, quiet complexity. I have a sample that I haven’t tried yet . . . but this review has pushed it to the front of the line. I think I was afraid that I’d end up purchasing a FB immediately, and was trying to pace myself. The concentration of the Ann Gerards is quite confusing. Luckyscent lists Ciel d’Opale and Perle de Mousse as EDPs, but Cuir de Nacre is listed as an extrait. However, they’re all the same price for the same amount, which seems counterintuitive. Based on the reviews I’ve read, these all behave like lighter EDPs — and on me, Perle de Mousse barely lasted an hour. Weird. You’re so smart to try a sample first! As for Cuir de Nacre’s concentration, I wonder if in the EdP concentration it was simply too fleeting? Even at high concentrations, some fragrances are quiet (and I know some horrendously loud EdTs). I loved this review and the fragrance sounds wonderful. I have been looking at that attractive trial kit. I might just spring for that. You know, your review of last week combined with Suzanna’s soap review on BdJ a day later made me buy some Maja soap. I don’t have any particular perfume association with my grandmother, but she always used Maja soap. Thank you for that as well! I always adored the Maja packaging. It looks so exotic–and the soap is black, right? That’s pretty exotic, too. Remember your grandmother with joy! It’s a good one, that’s for sure. I read your review and uncharacteristically ordered a sample immediately. How could a moss lover not? I’ve since read other reviews, and in my mind they describe this so differently. I would not have reacted the way I did. However, I think you nailed it. Cuir de Nacre is an immediate favorite. I could bathe in it! I’d like a little more sillage to it but because it does sit so close to the skin, I think this will become my go-to perfume. It’s really easy to wear, isn’t it? But I agree with you–I’d love a little more sillage and, especially, persistence. I can easily see this being a signature scent for someone, though.